Cambodia | Where is Yvette? Angkor Wat Archaeological Park- I heartily agree with the consensus whereby if you find yourself in South East Asia you should go see it. I think the pictures speak for themselves. Prices- I’ve gone through all of Asia remarking at how cheap everything is, but things hit rock bottom in Cambodia. The funny thing about this is as a result Cambodia was probably the most expensive country in the region I visited, as it’s all too tempting to pay the few extra dollars- sure you can get a room for $3 but $10 gets you what is essentially a hotel room in the West with air conditioning, so why not? Hungarians- For reasons I can’t completely work out, most of the people I hung out with in Cambodia were Hungarian. As in there were eight of them at my guesthouse, a few I ran into at Angkor, and six of us on the bus ride to Bangkok! Kind of an interesting surprise. New music- If you travel in this part of the world, you will inevitably run into someone selling music and movies for your iPod on the streetcorner. Cambodia takes this a little bit further in that there are some very nice stores set up for this particular practice, and they sell albums at a dollar a pop so I visited one inquiring as to whether they had the new U2 album that had been released two days prior. They did of course, and I spent a happy amount of time getting new tunes for my iPod and movies for my computer. After two months, trust me, this was very exciting. I’m not going to lie, Cambodia’s recent history and poverty today are not particularly pretty. The country was decimated and destroyed not too long ago and is on the long road to recovery, but that doesn’t mean you won’t see plenty of poverty around you from kids trying to sell you trinkets instead of going to school to musicians missing limbs and playing on the streets. It’s heartbreaking. I did have an interesting conversation with a guy who worked at my guesthouse though about this, who is going to school at night to study tourism in hopes of being a hotel manager (and said this in the same tone you hear from a guy in the US who tells you he is studying business in hopes of going to Wall Street). He asked me how many beggars I saw compared to other countries in the area and I had to admit, lots of people try to sell you stuff but there is pretty minimal outright begging. I found this comment to be so, well, different from what one usually hears that I am repeating it here. visit Cambodia! When taking a break from seeing Angkor Wat, the first thing any tourist goes to see in Siem Reap is the Cambodia Landmine Museum. If you think this sounds depressing, well, first of all of course it is but second of all everything relating to modern history in Cambodia is going to be depressing. This is the country of Pol Pot and the Khmer Rouge after all, who killed 800,000- 2 million people (25% of the population) in the late 1970s through forced labor, starvation, and blunt extermination. Compared to other countries in the region, I had to look hard in Cambodia to see anyone who looked qualified to be a grandparent or even my parents’ age. So where did the landmines come from? A lot were from the Khmer Rouge during their regime. A lot more were laid by the Vietnamese who invaded Cambodia in 1979- the Khmer Rouge fled into Thailand so a lot of mines were laid on the Cambodian-Thai border. All in all it is estimated that up to six million landmines still exist in Cambodia, and several thousand people are still maimed or killed each year. They organize into bands playing Khmer music around Angkor Wat and Siem Reap (not much dignity in being an ourtright beggar) and trust me, if you are around here and never find yourself parting with a few dollars I’m pretty sure you have no soul. The Cambodia Land Mine Museum was founded by a former child soldier recruited both by the Khmer Rouge and the Vietnamese Army who laid landmines, and is now devoted to the arduous task of de-mining. (It should be noted that all tourist areas of Cambodia have been very thoroughly de-mined years ago, and no forgein visitor has ever been killed by a landmine while in Cambodia.) The museum is mainly a collection of old defused mines from all over Cambodia, which originate from all corners of the globe. It should be noted by the way that Angkor Wat was the scene of some of the most intense fighting by the Khmer Rouge- Pol Pot held it up as an example that Khmer people are capable of doing anything. Apparently the irony of using a masterpiece of religious architecture as a reason to promote your atheistic farming commune was lost on them. And last but not least a bumper sticker you see a lot in Cambodia these days saying “I support the KR trials.” While the brutality of the Khmer Rouge was primarily in the 1970s there were still some strongholds up until the late 1990s in Cambodia- Pol Pot died a natural death in 1998- and UN-backed trials to address the genocide are just beginning. The first trial is set to begin in April and naturally dominated the headlines of the English newspaper every day I was in Cambodia. The trials are not without controversy for several reasons, the main one being that they are proceeding at a very slow pace. Most of the defendants are getting up there in the years and there are still a lot of Cambodian politicians who think it would be best to let them quietly pass away. We’ll see what happens. Needless to say, you brood a lot over tough topics when visiting this country, and pray such things will never happen again. But for now in this part of the world all one can do is wait for the wheels of justice to turn and try and make things safer, defusing one landmine at a time. The following is going to be really long and filled with pictures, but I don’t care because I took over a hundred in three days and they’re all spectacular. So you’re just going to like it, deal? If you ever come to South East Asia, it soon becomes evident that the consensus is you are required to see Angkor Wat, a series of ancient jungle temples in Cambodia, to the point where yes you should take that flight from Laos for your last week on the continent to see it. And frankly I’m included in that number after having visited- I mean, have you seen a better place in the world to play Indiana Jones? I even had a dorky hat! When built around the year 1100A.D., Angkor Wat and its surrounds were the largest city in the world (Europe wasn’t much to write home about in this era). The temples were also all originally Hindi and show a heavy Indian influence due to numerous Indian traders around at the time, but later became Buddhist when the population converted. And do that again and again and again, for three days. A large fraction of people are too exhausted after the first day but I loved it, and ended up exploring for three. I fell into a great rhythm whereby every day at nine my motorcycle taxi who I hired for $12 a day would pick me up, I would clamber all around a temple until I’d seen enough while he waited in the shade, and then we would move on to the next one. When not in the temple itself you usually get accosted by at least one Cambodian child trying to sell you cold water or postcards which was a bit heartbreaking. Poverty is never very far off in Cambodia. One of the most beautifully preserved temples, a decent motorbike ride away from most of the temples. One of many monkeys wandering around the area, who are smart enough to steal water bottles from tourists and drink from them. Because these would not be proper jungle temples without monkeys. Having fun exploring a temple still overgrown with trees, which drip down the temple walls with their roots. 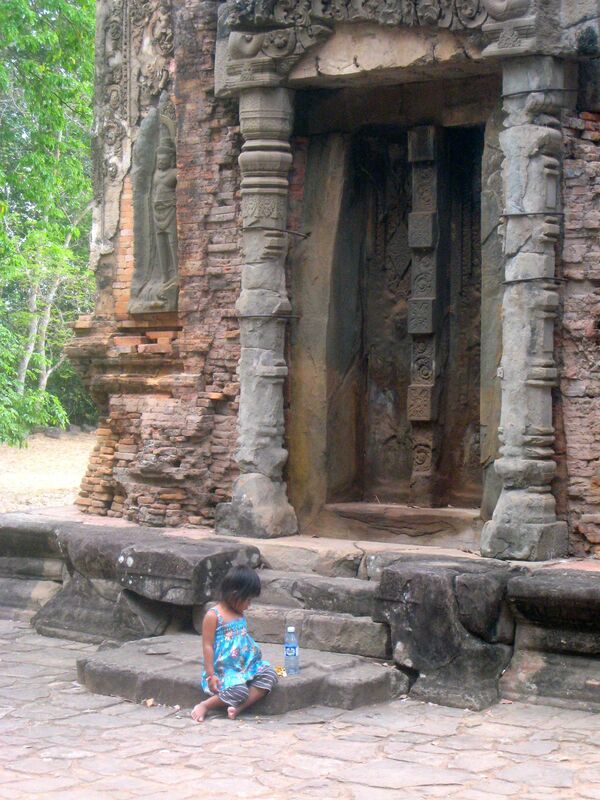 Everyone feels obliged to mention that this is the very same temple where Tomb Raider was filmed, which I’ve never seen but I mention because the guy who took this picture told me I was having a Laura Croft moment. On the note of restoration, well, beyond the main temples hardly any has started really due to lack of funds. The ones currently being restored are being done in conjunction with aid from another country (Japan seemed the most prominent), but the ones still awaiting funds for restoration just have wooden beams propping up the walls that look ready to collapse. Oh, and because this is Cambodia you can walk anywhere and there are signs telling you to please not touch anything, but it’s not like anyone’s stopping you. This is apparently the most famous place in the Tomb Raider temple, as proven by the fact that all the Westerners needed a picture of this overgrown tree (as opposed to the dozens of other trees, lots of which looked a lot cooler). The main temples are indeed very touristy, from backpackers like me who hired a motorcycle taxi to round German couples named Boris and Helga who talk too loud to Japanese tour groups who only put down their cameras to flash peace symbols for other people’s cameras. The trick is to make sure you spend time at the lesser-known temples, which are often just as spectacular albeit a little smaller. But often you can have the temple to yourself, sitting in a musty old windowsill. I did that a lot, imagining what it must have been like to be in the middle of bustle and noise a thousand years ago, what the reaction would have been if I told them no one was around anymore except a girl from a continent that hadn’t been discovered who was enjoying the history for a few minutes. And then I would wander off again, looking for the X marking the spot and mindful to not tell the evil monkey of my plans. Indiana Jones has got nothing on me!